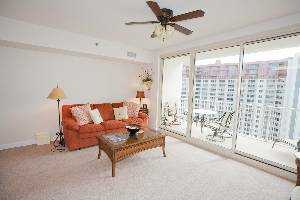 Panama City Beach Condo! Call or Email For Specials! This unit is on the 18th floor of a brand new development that has been open for less than 9 months. Connected to the parking garage you have very convenient access to your vehicle. 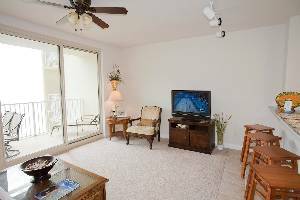 This condo is the perfect place to forget your cares and unwind, but if you do need to stay in touch with reality Wireless internet is also available. Directly on the "World's Most Beautiful Beaches" facing the Gulf of Mexico, this brand new family resort in Panama City Beach, Florida is the ideal vacation destination. This upscale development includes an 18,000 square foot gulf-front pool, indoor pool, fitness center and indoor spa, and much more. The condo is in a prime location on the 18th floor. The living room is equipped with a 38" TV. There is upgraded cable with 12 HBO movie channels. High speed wireless internet is available free in the condo. There is also Wi-Fi available in the lobby and poolside. 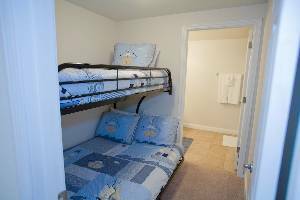 There are two full bedrooms and one bunk area with 3 private bathrooms. The master bedroom has a king-size bed with a 26" TV. 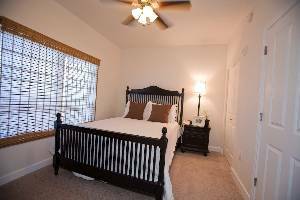 The second bedroom has a queen-size bed with a 19" TV. The bunk beds are each twin size. All 3 bathrooms are marble. Two of the bathrooms house a combination tub/shower. 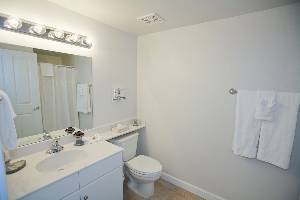 The third bathroom houses a shower stall. One of the bathrooms is wheelchair accessible. The kitchen is equipped with dinnerware to serve 12. The condo also has a coffee maker, toaster, blender, and pots and pans for your convenience. 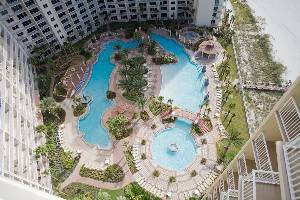 The unit offers a breath-taking view of the beach, ocean and gulf front 18,000 square foot pool. There is so much to do in Panama City Beach. Between Shipwreck Island Water Park, Gulf World Marine Park, Ripley's Believe It or Not!, Ebro Greyhound Racing, and Zoo World. Also there are endless trails of mini-putt golf, boating, fishing, water sports galore, lots of shopping, restaurants, and seafood festivals. It's a great place to just do nothing at all. Panama City boasts "The Beach Lover's Beach." The development of all the new resorts brings in upscale dining, shopping and golf. The beautiful, family-oriented complex is the perfect spot for your next vacation. 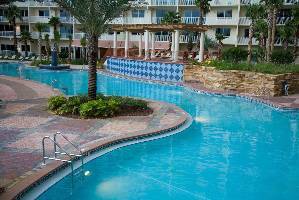 Other Fees: Refundable Security Deposit of 250.00 This will be returned to the guest approx. 3-4 days after departure if everything is found in order by our inspection crew.